www.drbig.info • View topic - Clack clack clack! If the motor is cold i`ll pull in the manual decomp lever and thumb the start button. The engine spins over fine with just the normal engine cranking sounds. When the engine has spun over for a second or two at a nice`n`quick speed i dump the decomp lever where at the correct point in the cycle the decomp mechanism is released and the handle lever returns to the `off` position - at this point while still cranking but before the engine fires i get an horrendous-sounding CLACK noise which seemingly occurs once per revolution. It sounds like someone sharply tapping the crankcase with a pin hammer. Once the engine fires into life and the starter button is released the noise is not heard again. When the motor is warm i carry out the same start technique but the motor fires almost instantly and i get one `clack`. Is this anything ominous going on here or `do they all do that, mate`?! As far as i can tell through a very short test ride there is nothing seriously amiss with crankshaft/rod/bearings etc. The noise you hear is from the starter clutch. This is a common problem. There have been plenty of posts about this problem so I suggest you search for them as I don`t feel like repeating myself at length for the umpteenth time. Do not hold the decomp lever down or you`ll bend valves. Is the `reversing the pins` trick worth trying? On other bikes i`ve had a failing starter clutch usually manifests itself as a whirring starter motor but no drive to the crank. 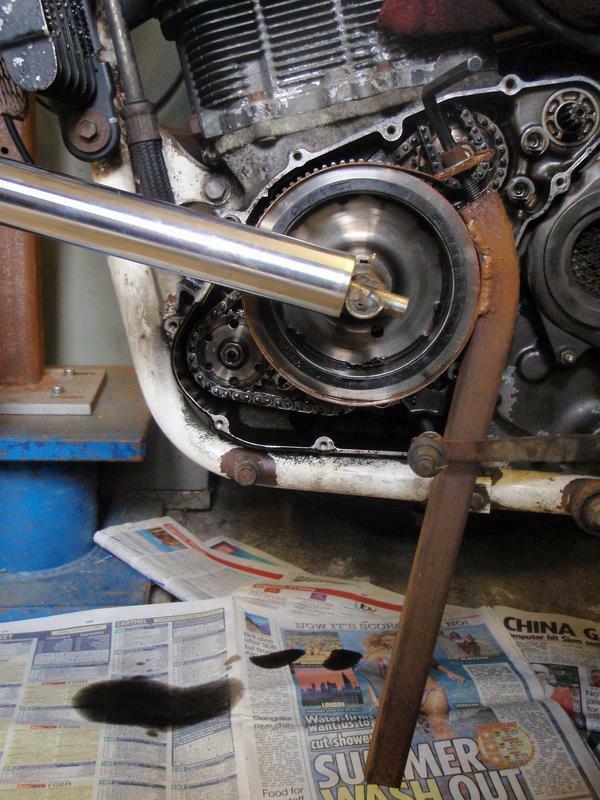 Surely adequate clearance has been designed in to prevent piston/valve interace if the decomp lever is pulled in during cranking or at idle speeds - that`s the recommended method to stop these engines i`ve read? 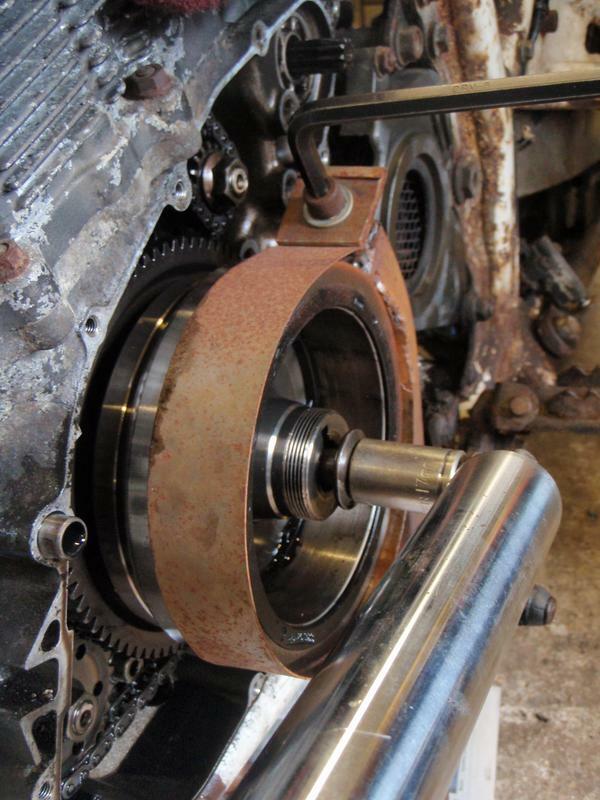 just to be clear the noise i here is not a graunching, grinding noise as if the starter clutch is slipping on the drive gear/crank, it`s just one err, clack. The engine cranks fine. May just be the backlash in the starter gears between compression strokes. With the drive train gears removed the starter clutch drive gear is immovable..
A rotor removal tool was acquired and is now in situ under load for a few days - they`re tight, arn`t they? The new starter clutch has been installed and the noise has gone and the engine starts very well. 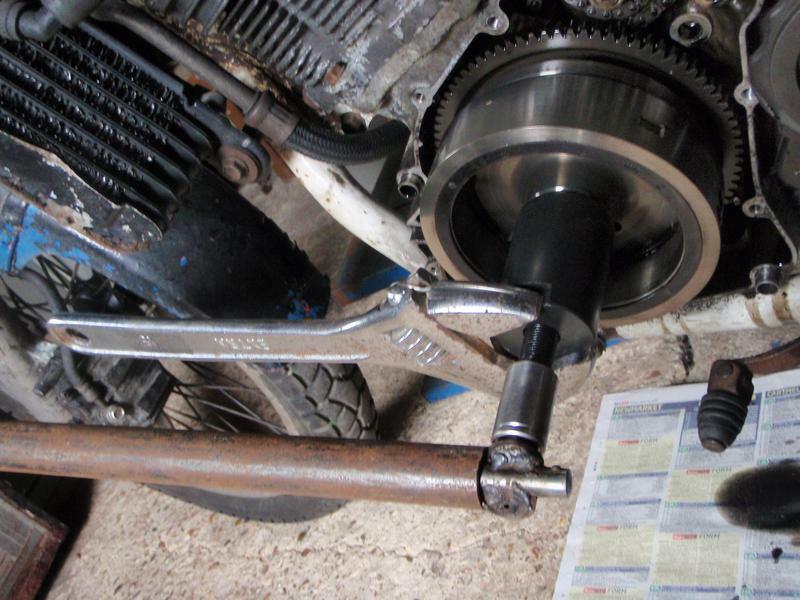 Rotor removal tool - £30, starter clutch - £180.